NSPE has launched a new and improved salary survey and members can now receive free, unlimited access to complete salary survey data just by participating. For many years, the Society published its own salary survey and then in 2003 began a joint survey with ASCE, ASME, and other engineering groups. Several months ago, NSPE decided to take the survey in a new direction for the benefit of both the society and its members. Now NSPE fully owns and operates its own survey, just like it did from 1952 through 2002, giving the society a lot of historical data and credibility in the survey and its results. "This week, NSPE launched an exciting new member survey," said executive director Larry Jacobson. 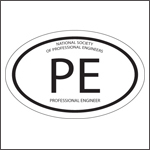 "It's the salary survey our members are familiar with, but it now has a new approach that will provide yet another valuable reason to be an NSPE member." Members who complete the new survey by March 31, 2009 will not only get free access to the complete results but will also be eligible to win one of two $200 American Express gift cards. The more participants in the survey, the stronger the cooperative becomes and the more valid the survey results. This is a benefit to members, the Society, and to the media who frequently use the results in stories promoting engineering as a profession. Nonmember/Nonparticipant: $595 unlimited report access for 12 months.